First things first: Scarlett had her MRI Monday, and we heard Tuesday that it is all clear. Hooray! Three months until the next. 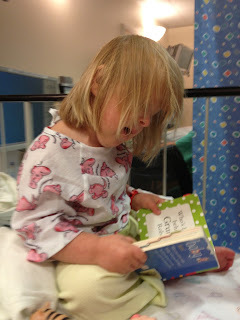 Reading and singing while she waits for MRI - the nurses were loving her goofiness while she waited. Unfortunately, she is neutropenic. Her white blood cell count is very low, which means she is not yet ready for the next dose of chemo. This happened regularly in her first chemo adventure, but it's the first time with this regimen. Luckily, you'd never know she was sick - she has been the most active, most pleasant and most lovely she has been in months. 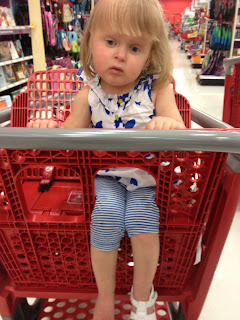 No puking, no constipation, minimal tantrums - just Scarlett. 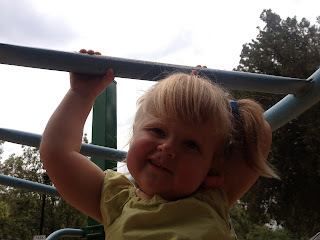 Her doctor echoed my own thoughts - did we even give her the chemo?! Those low blood counts prove it, for sure. Until her counts recover, we wait for Round 8 to begin. Of course, it's the last round, so we are more than ready for it to start so that it can END. I was hoping we would be done and ready for a fresh start when school begins at the end of the August. Now, maybe not. We're on Scarlett time, so it will happen when it happens. This may be the picture of all pictures...Scarlett climbed her way right into the toilet. She was happy, splashing around. 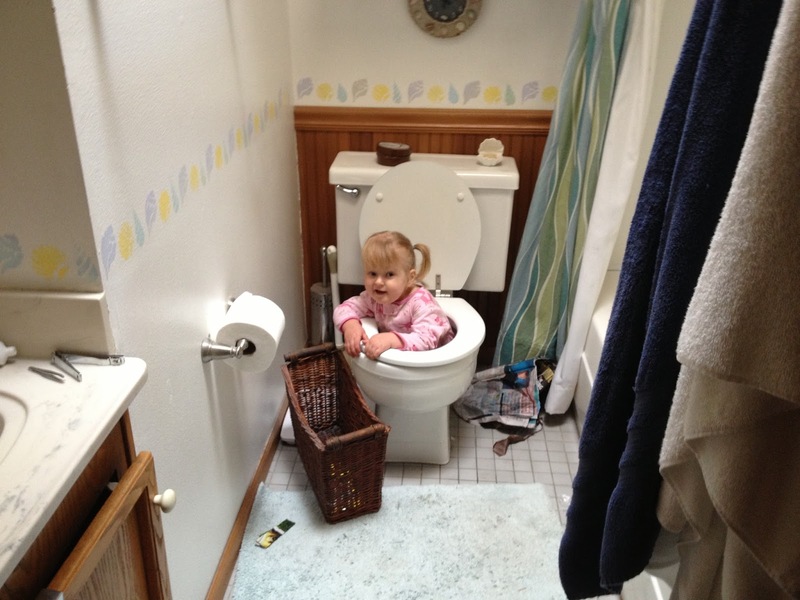 We took the picture, put her directly into the tub, and then got a baby-proofing lock. Insisting on putting both legs in one hole...and taking this picture brought the lost shoe to my attention. Never found that shoe. It's been great being home and enjoying some time together. Our weeks are still busy - PT, OT, labs or chemo, MRIs, and several other appointments on the horizon - but we can all sleep in and be a little more relaxed, and that goes a long way. We took a little trip to visit some friends last week. We met them at our first family camp for pediatric brain tumor patients, and we immediately connected. Their son endured a very aggressive treatment for a brain tumor when he was 2 - he's now 17! Their daughter is also a counselor at camp, and Scarlett loves them all. They made us feel welcome and comfortable at our first camp, and then - surprise! - they were at the second camp, too! After spending several weekends together at camps, they invited us to come stay at their house in the mountains. We had a great time visiting and talking about life before, during and after treatment. There are just some things that only someone who had been through it can understand, so it is a very special friendship to have. Finally, I would like to ask everyone to keep a few kids in your hearts. Phoebe's family just learned that her tumor has returned, and there are few further treatments to consider. On top of that, she got a nasty infection that gave them a big scare. They've had a rough few days, but it sounds like things are leveling out. Abby also has had a recurrence, and amidst her next treatment, her family is enduring other stressful issues as well. Both of these lovely little girls deserve so much more than this nasty disease had given them. That toilet picture is awesome. So glad to hear your latest good news! Praise God!! Praying Scarlett's counts come up quickly so this last chemo session can be over with. Praying for Phoebe and for Abby. The toilet picture is classic.